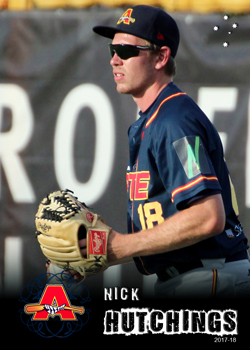 Hutchings is a local South Australian player who played with the Adelaide Bite during the 2017-18 ABL season. That was his fourth ABL season with Adelaide however, games had previously been few and far between for him. After playing five games in his debut year in 2012-13, Nick only played a single game in each of the 2013-14 and 2016-17 seasons. He did finally manage to break into the bullpen for more regular time on the mound in 2017-18, pitching in 16 games for the Bite.